Happy Monday! I hope everyone had a great weekend! I spent the weekend trying to slow down (I may have overdone it on Friday after my sinus surgery on Wednesday--I don't do slow well! ), and we of course had swimming lessons (or swim school as Bentley refers to it) on Sunday. I love seeing how he improves each week--normally I swim with him before his lessons if we have time, but between daylight savings time and recovery time, it didn't happen this week, but it seemed to be ok (you never know with a 3 year old!). This week I am featuring the Painted Seasons bundle. With a purchase of $120 or more in my online store at www.lisahenderson.stampinup.net, you can earn this designer series paper and stampset for FREE! OR if you only want the Designer Series Paper (or more of it! ), you can spend $60 or more and select just the paper as a Level 1 reward for Sale-a-Bration! And trust me, you will want more of the paper! So, it seems I am a little short on Birthday cards right now--I really don't know how that happens somedays--so I've been concentrating a little on those lately. And this one is super cute and easy! Stampin' Up! came out with some Sale-a-Bration Coordination items this year, and this stampset is one of them. I can not get enough of it--which is odd for me and a sentiment set! Usually I want all the images! This stampset is called the More Than Words stampset. It is available in both French and English, and according to Stampin' Up! 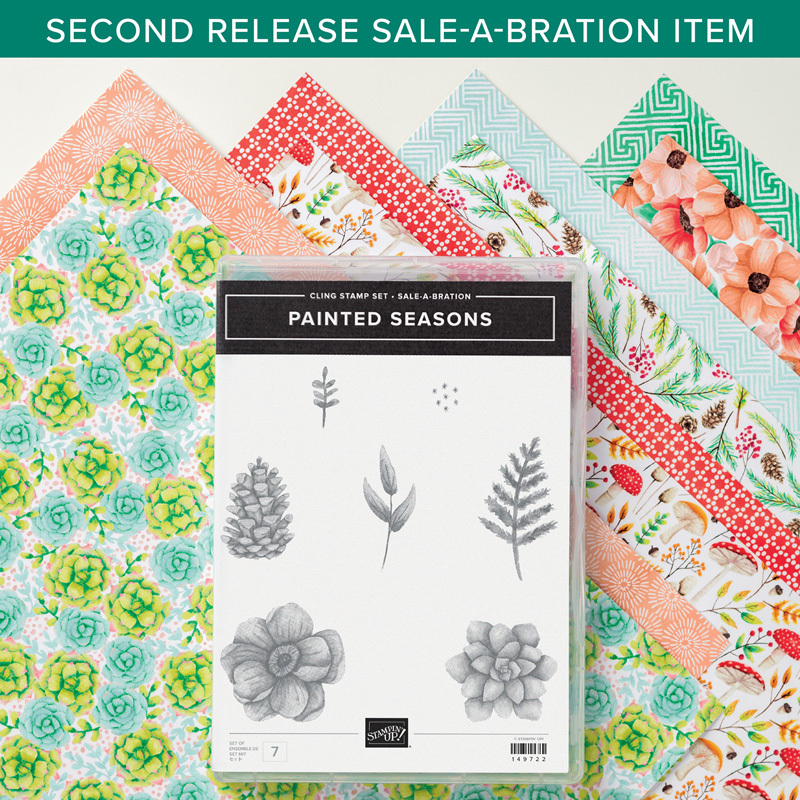 it "Contains expanded sentiments from the following Sale-A-Bration sets: So Hoppy Together, Painted Seasons, Hello Cupcake, and Lasting Lily." 1. Cut a piece of 5 1/2" x 8 1/2" Shaded Spruce Cardstock. Score at 4 1/4" to create a 4 1/4" x 5 1/2" card base (with the score at the top). Cut a piece of 4" x 5 1/4" Petal Pink and a piece of 3 3/4" x 5" piece of the flowered print from the Painted Seasons Designer Series Paper. Adhere the layers. 2. Cut a piece of 2 1/4" x 5 1/2" vellum. Adhere only in the centre (below where the ovals will go) to the card base. Make generous loops from the Shaded Spruce metallic ribbon, and adhere to the card base (a glue dot or a strip of tear tape works well for this) with the adhesive over the vellum adhesive. 3. On a piece of white cardstock, stamp the wishes in petal pink. Stamp over a second time with the bottom only piece for wishes in petal pink again (this will create an almost ombre effect). Stamp birthday over top in Early Espresso. Cut out using one of the stitched ovals and the big shot. Cut the next sized oval in petal pink. Layer together, and add to the front of the card with dimensionals.